Erica Bunker | DIY Style! The Art of Cultivating a Stylish Wardrobe: Review: Vogue 1513 | Badgley Mischka Asymmetrical Draped-Neck Sheath Dress! Review: Vogue 1513 | Badgley Mischka Asymmetrical Draped-Neck Sheath Dress! It's the most wonderful time of the year! Time for fall sewing! I love fall. I'm a September baby. This is MY season. I typically start off the season with "transition pieces". Those are the kind of pieces that work for my climate... because it's not going to be officially fall until close to Christmas. Unless we have some sort of extraordinarily chilly weather this year. With all of the weird climate conditions, I wouldn't really be surprised either way. So it's best to just be prepared for whatever Mother Nature tosses my way. I make a fabulous white dress every year, so this is my pick for this year. 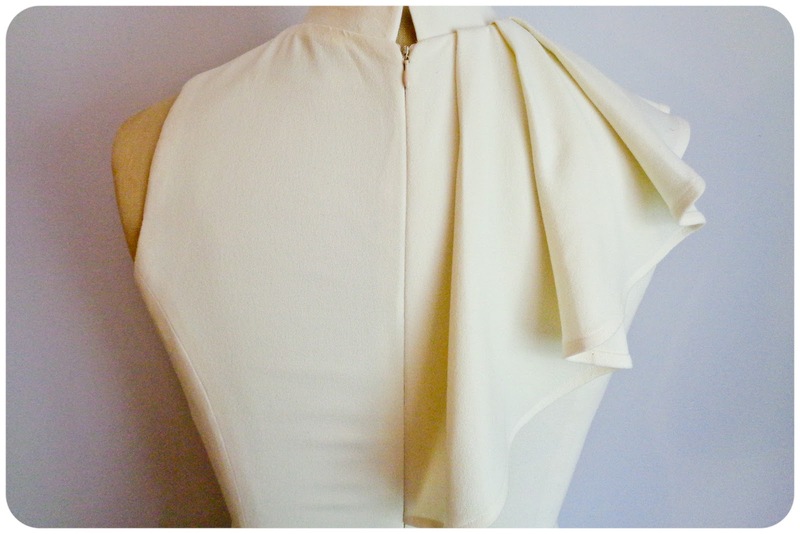 The fabric I selected is this completely gorgeous ivory wool-like crepe with lycra from Mood Fabrics. Since the dress is fully-lined, I needed the lining to match the stretch, so I picked this white stretch polyester crepe de chine. I cut the size 12 from the bodice and graded out through the waist and the hips in the size 14. I added 3 inches to the length and this is where the hemline falls on me. Keep that in mind. This is a basic sleeveless, princess seam sheath dress with a back slit. The only things that makes this dress unique is the asymmetrical drape and the collar... and the construction suggestions. 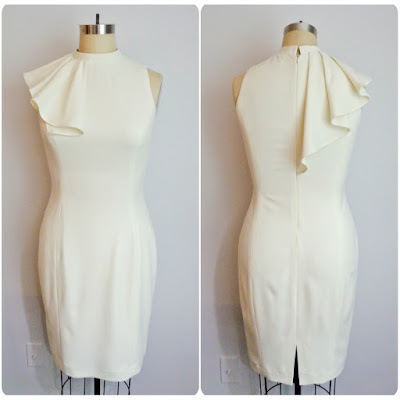 Here are some key factors that in my opinion takes this dress from basic to designer: The interfacing. Interfacing is a big deal. And in my STRONG opinion, the average home sewer does NOT use enough of it. There are so many places in garments that should be interfaced. We ALL use fusible interfacing, so it's beyond easy to do and not eliminate these essential steps. I'm going to just assume it's because a lot of you don't know what you don't know. This is something I've learned throughout the years from sewing the designer patterns (they have all of the good construction details), reading sewing books (seriously, invest in couture sewing books), and reading blogs. Every sewing blogger may not be your cup of tea or shot of tequila. If I had my pick, I'd ONLY read blogs by those that combine sewing and fashion. But there are a lot of blogs by people that can really, really sew... and understand garment construction. You can add in your own fashion. Here is how this dress is interfaced. I've seen the interfacing for the front, back and sides of the dress in books. I only interface like this on the regular for jackets. But from this point on, I'll always interface dresses like this. Normally, I use stay tapes in these areas, but I love the idea of fusible interfacing shaped like facings. But I interface EVERY SINGLE THING I put a zipper in. It's imperative that the zipper area is interfaced. No one wants a wavy or "homemade-looking" zipper insertion area. And if you aren't interfacing your slit or vent area... sigh... Just don't even bother including that detail in your garment. It just makes the slit area so crisp. And while I was down there, I tapered in the skirt 4 inches smaller than the fullest point of the hip measurement. The drape is sewn in between the front and the side seam and the center back. And it's finished with a narrow hem. I shortened the collar by 5/8" an inch. It was too high for me. There is some handsewing involved when sewing the lining to the shell fabric at the armholes and the lining at the slit. I machine-stitched the lining to the zipper tape. And I also did a machine blindstitch for the hem. I absolutely love this dress. But sadly, it's so unique with the draping that I can only wear it a few times before I'm over it. But I'll at least have these pictures to reflect back on! 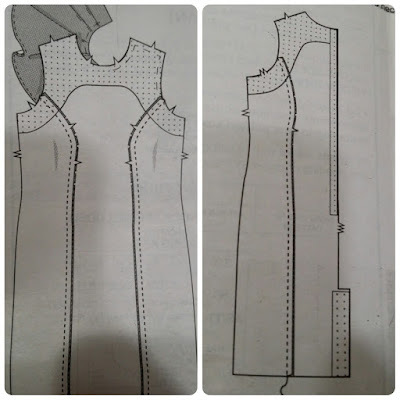 Interfacing is fused directly to the dress fashion fabric and not to a facing? Did you use pinking shears to help keep a line from showing? Very interesting..
Oh - I hit publish too quickly - the dress is stunning!! The interfacing is fused directly to the fashion fabric. I didn't find a need to use pinking shears. I only would do that if I was using a sew-in interfacing like a horse hair canvas or muslin fabric and that would be solely to keep the edges from fraying. Thanks so much Angela. I love this! Id love to see some more details of where your interfacing and some pictures aswell!! Unfortunately the dress is made. But I'll see if I can remember to stop and take detail shots on the next one. Thanks Frankie! Great review/information. Love the dress! What a stunning dress! Thank you for the tips. I really appreciate you sharing with us. Beautiful as always Erika. What a lovely dress. Yes, it is lovely and unique, but in a classic white/cream it also looks like the kind of dress you could put away for a few years and then wow everybody with again in the future. I also agree on interfacing. I have at least ten different varieties on hand here and I interface EVERYTHING. Truly the difference between homemade and handmade. Yes it is Debbie! Thanks so much! This dress is stunning. I'm just starting to learn how to sew so I'm thankful for this tips. And I will be looking for some couture sewing books. Sonya, if you go to my FAQs, you'll see my page for my favorite sewing books. I may need to do a blog post updating it. Thanks so much! Lovely dress Erica. Thanks for the tip on interfacing the zipper on all makes. Erica, this dress is gorgeous on you! I'm interested in what you said about learning better construction methods from the couture patterns. I consider myself a beginner so I shy away from those patterns, thinking they are too advanced for me and liable to end in disaster. But then I get frustrated when I buy an "easy" lined skirt pattern and discover that even though the pattern calls for a sheer fabric like voile, the directions are for a yucky centered zipper with an ugly rectangle of stitching going through both layers around the zipper, even though every skirt like that in RTW has an invisible zipper with the zipper tape concealed between the fashion fabric and lining for a clean finish... Attention, pattern companies: Get rid of the dorky "homemade" instructions in your patterns if you want customers to be successful enough to keep buying patterns! Like you, I've been reading sewing books and blogs (like yours!) to try and learn "what I don't know that I don't know." I'm glad Bernina picked you as a brand ambassador, because that's how I found your blog. I love that you share your techniques but also that you have a great fashion sense and the things you sew are things I would actually want to wear. So as I was looking at this post, I remembered an article I read in Threads magazine years ago and I found the back issue. Lisa Shepard is the author, and it's "Invisible Underlayers: Skin-toned Facings, Pocket Bags and Seam Allowances Won't Show Through Light-Colored and Sheer Fabrics." Threads Issue #96, August/September 2001. I think you can get that back issue online from Threads but if not, email me and I'll scan the article for you. The author has beautiful dark skin like yours and she uses Sheer Magic by HTC interfacing in a shade that matches her skin tone on the wrong side of her seam allowances so they don't show through as light colored "lines" in her sheer or white garments. The source in the article for her interfacing is www.htc-inc.net. I hope you don't think I'm being critical of your dress. It's truly stunning and the seam allowance show through might be happening only in the photos from the flash, and not in real life. But I have been enjoying your blog so much and learning so much from you, that I was glad to think I might be able to share something useful with you as well. Thanks so much for your post Rebecca. Worrying about seam allowance show-through on a white garment when the flash fires is not something I'm going to fret over. My only concern will be to make sure that I take the time and use a rotary cutter for clean edges and to make sure that they are pristinely pressed. I have so many constant fit issues that I have to worry about first. But that's a great tip for someone who wants to take that particular step. And if you goggle back some years, I did a post about pocket show-through and how I always eliminate pockets on white pants because it's such a PITA to worry about tracking down fleshtone interfacing. I just found a Bobbi Brown foundation that I think is perfect and I've been wearing makeup for over 30 years! But thanks again for your comment and tips! Simply beautiful...I am going to try the interfacing tips..what interfacing do you use in these areas?? I use to use French Fuse from Hancock Fabrics, it was my go to interfacing for years. I now use HTC Fusible Tricot and I buy it from Vogue Fabrics.com. Thanks Lora! This is just gorgeous! I was just thinking that one would need to be very toned to wear it so tight. And you obviously are! I'm going to take your tip and use interfacing even if the pattern instructions don't ask for it. The fabric has a lot of stretch. It's a woven but it behaves like a knit. There was a lot of bagging around the middle, so it had needed to be tapered in. Or it just wouldn't look like how I envisioned. Thanks Ann! Gorgeous! Curious, what do you do with your handmade items when you're no longer into wearing them? Donate to a charity, give to a friend or family member, something else? I have a favorite charity I donate to. Thanks Genevieve! This is a beatiful dress. Thanks so much for sharing your knowledge about interfacing. If you ever had time, it would be interesting to know what blogs you find particularly useful. It's hard to know what information to rely on. Thanks so much for being an inspiration and for sharing with the sewing community. When I first started sewing some years ago, your blog was the one that showed me how to combine fashion with sewing. Thank you for mentioning the interfacing around the zipper. I'm still a novice when it comes to sewing and hearing the info you are giving is very much gold to me. Truly a gorgeous dress that fits you perfectly. You look beautiful (as always)! Thanks for sharing your advice on interfacing. It's helpful to learn more professional techniques from someone with amazing style! Beautiful, yours is WOW, theirs is meh...(I meant the one done by Vogue) Also thank you for the sewing tips, I really look for those sewing tips, they make all the difference, thanks! Beautiful Beautiful work! I have this dress and thinking a stunning LRD! I have been adding interfacing to my fashion fabric for years - a great tip I learned from my teacher in tailoring school. I find that the corners, fronts and arm holes look very polished and that is what I want on my garments. I also stabilize seams with interfacing or wiggan on slinky and "growing" knit fabrics as well. Thanks for sharing that info. Since it is an "extra" step, I'm hoping folks will catch on. This is what makes the difference in great looking custom garments. You have said it well! Carol, you're a pro! I wouldn't expect anything less from you! I learn from you as well! Thanks! You did a fantastic job as usual and you look fabulous in it. Such a beautiful dress. 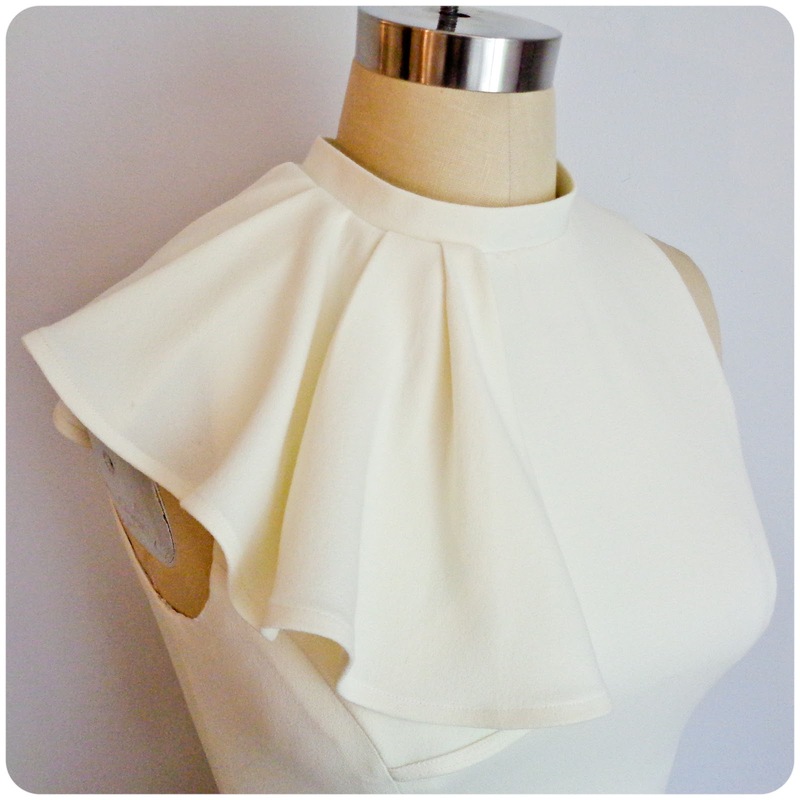 Love the collar detail. And I have made note of the interfacing tips and definitely applying them. Very very classy. This pattern caught my eye when Vogue released it. Erica, your work is exsqisit, it look amazing on you keep inspiring. Luv you much & God bless you and your family. I am so glad that you did a review on this pattern. I bought in June but was existant to give it a try given my skills level. My main concern with this pattern is the hand sewing part especially at the armholes. Do you think twinkling it a little by joining armholes leaving the neck open and sides can help by-pass the hand sewing at armholes? How did you achieve yours ? Anyway you can post pics? I am not a hand sewing person and I am afraid that I might spoil my project. I am making one on a red Ponte de Roma fabric and will follow some of your suggestions as well. The dress looks amazing on you. I know very few people that are "handsewing people". It's a necessary evil in sewing. 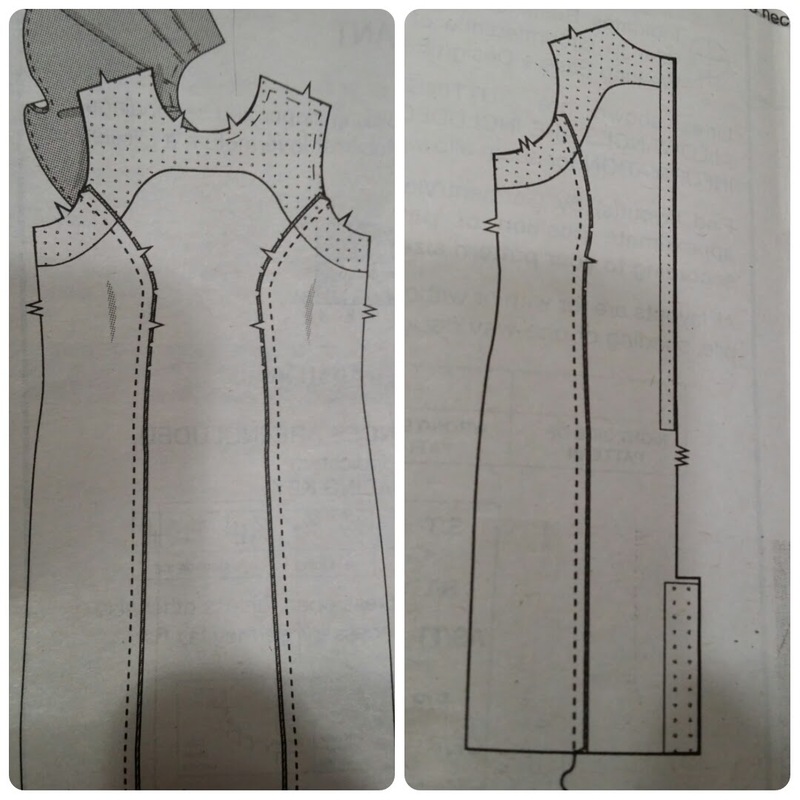 You can google how to sew a lining to a sleeveless dress and find detailed pics and even Youtube videos. I don't mind the hand sewing because I know there won't be a cleaner way to do that finish. This dress and you in it are FABULOUS! I like this style. I think I may use this with some crepe fabric I bought. Thinking of shaking it up a little with a little colour blocking. They should use your pictures to advertise the pattern. You do it way better. Great job Erica.